Hi guys! This week I will give you some tips on what to look for in your preliminary title report. It can be a little daunting to review and to some people might even look like a foreign language. Luckily, my friends at Orange Coast Title have helped me put together these tips that I thought would be really useful to anyone looking to buy or sell their home. 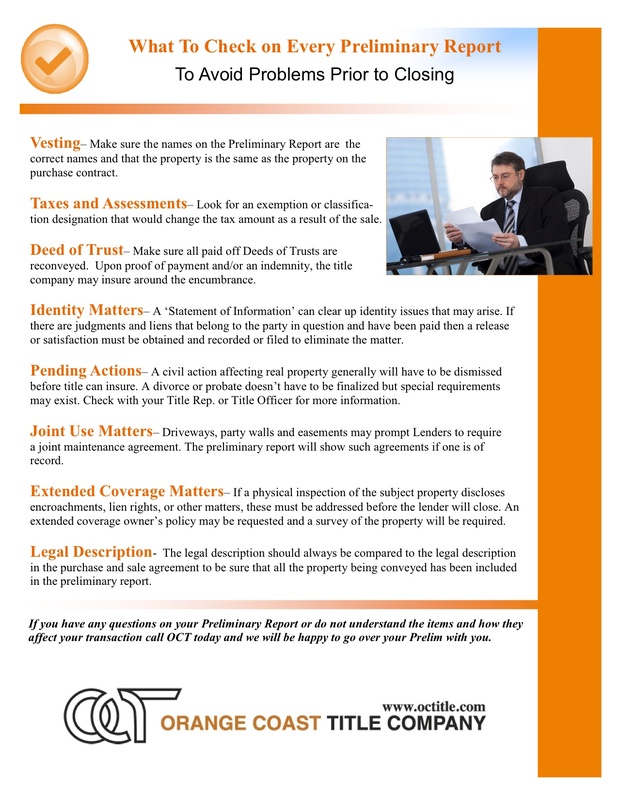 A preliminary report is a report prepared by a title company before issuing a title insurance policy. This report shows the ownership of a specific parcel of land, together with the liens and encumbrances that will not be covered under a subsequent title insurance policy. The report contains the conditions under which the title company will issue a particular type of title insurance policy. It lists title defects, liens and encumbrances,which would be excluded from coverage if the requested title insurance policy were to be issues as of the date of the preliminary report. A preliminary report provides the buyer with an opportunity to seek the removal of objectionable items referenced in the report, prior to closing the sale. Pay particular attention to the nature of the ownership interest in the property you will be receiving, as well as any claims, restrictions or interests of other people involving the property. The most common form of interest is “fee simple” or “fee”, which is the broadest form of interest an owner can have in land. Liens, restrictions and interests of others, which are being excluded from coverage will be listed numerically as “exceptions” in Schedule B of the preliminary report.An example of a common type of third party interest is an easement given by a prior owner, which may limit the owner’s use of the property. A printed list of standard exceptions and exclusions listing items not covered by your title insurance policy may be attached as an exhibit item to your report. Here’s a flyer OC Title has provided us. As Always, feel free to reach out to me with any title questions! It’s Here! New Listing in Tustin!